Check one, two. 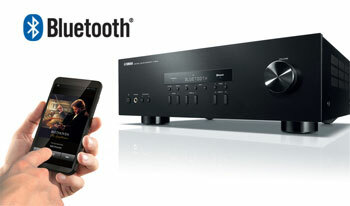 Equipped with speaker terminals for two systems, this receiver lets you connect two sets of speakers. 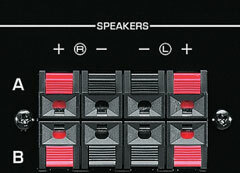 The speaker selector makes it easy to switch between speaker outputs, allowing you to hear the sound from one speaker system A or B (8Ω min) or from both A+B (16Ω min). Try the Yamaha NS-6490 bookshelf speakers and the YST-SW216 powered subwoofer with the R-S202 for an ultimate stereo system.